A Chinese company dropped its bid to acquire an advanced manufacturer in Germany after the German government prepared to veto the deal, reports Caixin Global. The big picture: U.S. lawmakers are already working to strengthen reviews of foreign investments, primarily to block Beijing from acquiring U.S. tech and defense secrets. The fear that Chinese tech investments will give Beijing an economic and national security edge is now hitting Europe, too. 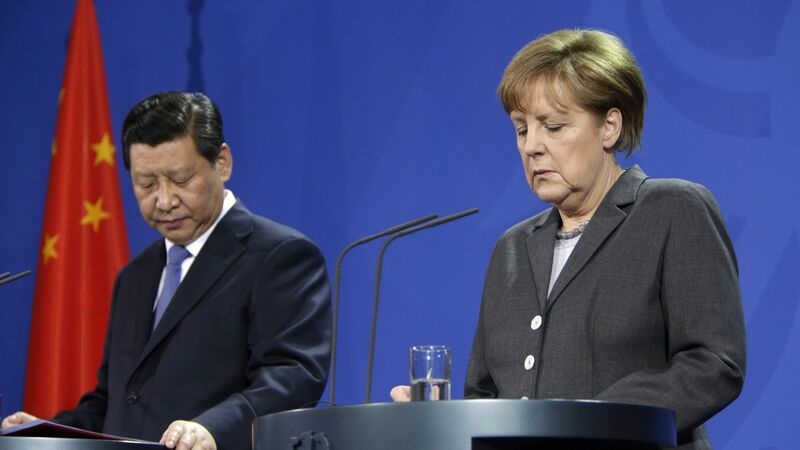 China partly modeled its "Made in China 2025" plan after Germany's "Industrie 4.0" plan to dominate high-tech manufacturing, and German tech is of particular interest to Beijing. "Yantai Taihai Group Co. Ltd. had intended to purchase Germany’s Leifeld Metal Spinning AG partly through its French subsidiary for an undisclosed fee," according to Caixin Global. Yantai Taihai dropped those plans, which were eight months in the making, after learning of Berlin's intent to veto. Worth noting: It's the first time Germany has used its veto power in such a way, and that could have a “snowball effect" across Europe, Larissa Brunner, an analyst with Oxford Analytica, told Caixin Global.